Quiet cleaning any time it is needed. Great for hard bare floors and low pile carpets! No motor means quiet cleaning any time it's needed. Made with galvanized steel, these manual sweepers feature ABS plastic components and soft rubber wheels for smooth operation. 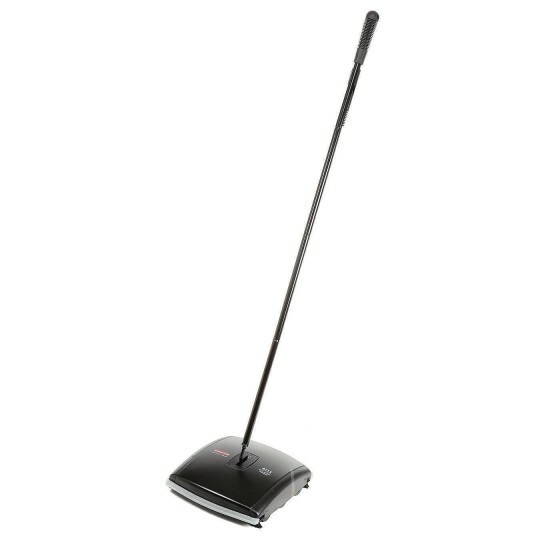 Offers low profile sweeping for easy access around and under furniture. Soft rubber wheels conform to surface. Includes 2 debris canisters with one-touch emptying doors. 7-1/2"W cleaning path. 44"H assembled.